Or should I say, cheers and happy days! I know it’s been a while since my last post (whoops!) but life abroad is a busy one. Among my studying for midterms and trying to keep my head above water at school amidst my fun (don’t worry, I’m not neglecting school!) I made my way to Ireland at the end of February! Let me just say…it’s going to be hard to beat that trip. I didn’t want to leave! We started our journey in Dublin and explored the city on Friday night, but my experiences on Saturday are the ones I want to remember forever. 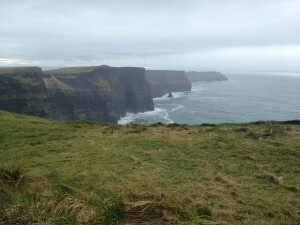 On Saturday my two friends and I were up and out at 7:15 in the morning to head over and begin our tour of western Ireland, which included a visit to the Cliffs of Moher! We took the tour with a company called Paddywagon, and it was honestly the best tour I have ever been on. The driver and tour guide, Matt, was super friendly and incredibly knowledgeable. As we drove throughout the day he recounted much of Ireland’s history and I learned so much more about Ireland than I ever have in history class. We finally made it to the Cliffs of Moher around midday after making several stops along the way. Let me just say this: if you want to experience the most beautiful sight in the entire world, go to Ireland, then get your booty over to the Cliffs of Moher. Seriously. They were breathtaking even with clouds in the sky. I can’t begin to imagine what they would have looked like in the brilliant sunlight. Despite covering 11 counties and over 400 miles of land, that tour ended far too quickly, and we spend the rest of our trip enjoying Dublin and the wonderful souvenirs it had to offer. For those of you wondering, yes, the music in an Irish pub is amazing!! We sat and listened to the music for hours and I regret absolutely nothing. The following day we went souvenir shopping and I brought my piece of Ireland back with me in the form of a Claddagh ring, while my friends bought other Gaelic things (get it?!). On the plane ride home I continued to experience the wonderful kindness of Irish folk in the form of a lovely gentleman who took pictures from the plane of the sky as we flew. 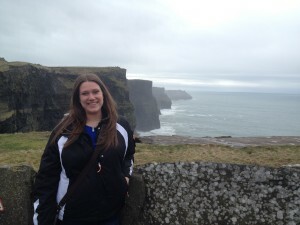 All in all….when can I go back?! ?